Viking/Penguin has asked me to hold this contest because of the immense crossover popularity of this book. Although originally geared toward the adult market, many young adults are finding this book and are loving it. So I'm very honored to be able to offer you a chance to win the book and some really cool buttons. Now, I have not read this book yet, but it's definitely on my list to read. I have heard some really good things about it and I'm totally excited for it. I love crossover books! Here are what the buttons look like. Now, because I don't know the story, the buttons mean nothing to me. But they're just cool swag. So here is what you have to do to win this Book and a Buttons. Post this comment on your sidebar of your blog +3 entries. only in the US/CA. The publisher will be sending out these prizes. On February 8, 2011, Viking is proud to publish A DISCOVERY OF WITCHES (Viking; $26.95; On-sale date: February 8, 2011; ISBN: 978-0-670-0-02241-0), the debut novel from history professor Deborah Harkness and the first book in the All Souls trilogy. A DISCOVERY OF WITCHES created a sensation at the 2009 Frankfurt Book Fair—translation rights have been sold in 33 countries so far—and has already captured the attention of over fifty book bloggers on both sides of the Atlantic. With rave reviews from all four trade publications under her belt (see above), it’s clear that Deborah Harkness is a writer to watch. 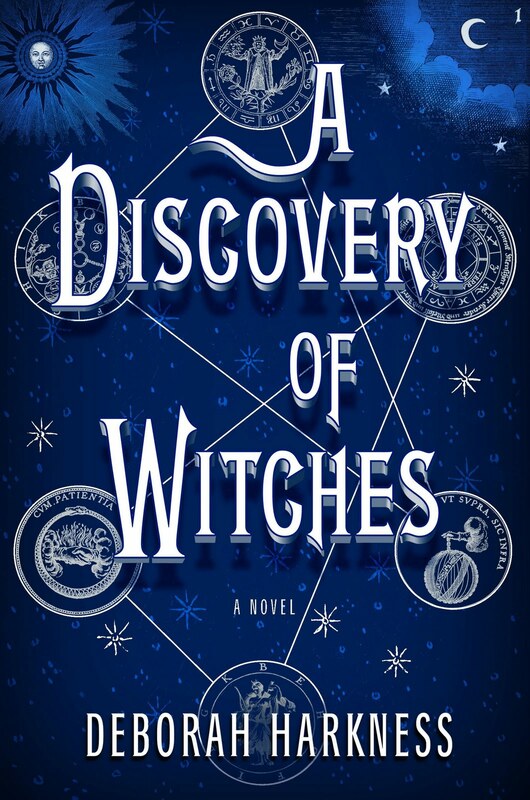 A DISCOVERY OF WITCHES begins on a late September afternoon when Diana Bishop, a bright, young historian studying amidst the ancient stacks of Oxford’s Bodleian library, calls up a medieval manuscript of alchemical illustrations. As soon as she picks it up Diana realizes that the book—Ashmole 782—is an enchanted object of untold power. As it turns out, Diana is not only a first-rate scholar of seventeenth- century chemistry but also a descendant of a long and distinguished line…of witches. She’s spent her adult life distancing herself from her supernatural destiny, and after a quick look at Ashmole 782 she sends the book back to the stacks and her magical history with it. Deborah Harkness is a professor at history at the University of Southern California. She has received Fulbright, Guggenheim, and National Humanities Center fellowships, and her most recent scholarly work is The Jewel House: Elizabethan London and the Scientific Revolution. She also writes an award-winning wine blog, goodwineunder20.blogspot.com. I'm about a third of the way into this novel and am just loving it! It's filled with history, intrigue, magic and romance! What more can a reader ask for?